Many iPhone users choose to backup data to iTunes as as it is the guard in case your device is ever lost, damaged or you lost some data. If you want to extract part of the data in iTunes, like messages, restore from iTunes would be the first choice. However, when restoring from iPhone backup, it would recover all sorts of iPhone data, which means that all your current data on your iPhone will be overwritten and replaced by the previous data in the backup, including photos, contacts, notes, reminder, calendar, etc. At this moment, you may hope to there is the alternative way to selectively transfer messages from iTunes to iPhone. Actually, it is impossible to selectively transfer messages from iTunes to iPhone, what you need is the professional iTunes data extractor, iRefone. This tool could help you selectively extract all of the data from iTunes and iCloud backup. 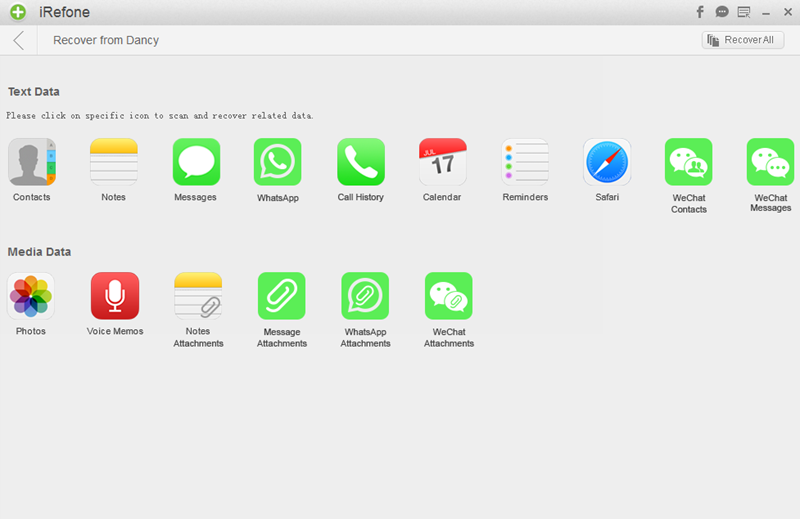 Besides, it is able to recover deleted messages, contacts, call history, whatsapp, wechat and more directly from your iPhone, iPad and iPod. Now, let’ me show you how to selectively transfer these messages you need in iTunes to iPhone. Step 1: Connect your iPhone with computer, and launch iRefone and choose “Recover from iTunes Backup” as the recovery mode. All of the iTunes backup files which you have ever synced with iTunes on this computer will be automatically found and listed in the software. Click “Select” or double click to choose the backup you need. Step 2: Then the software will ask you to choose the data you want to scan. 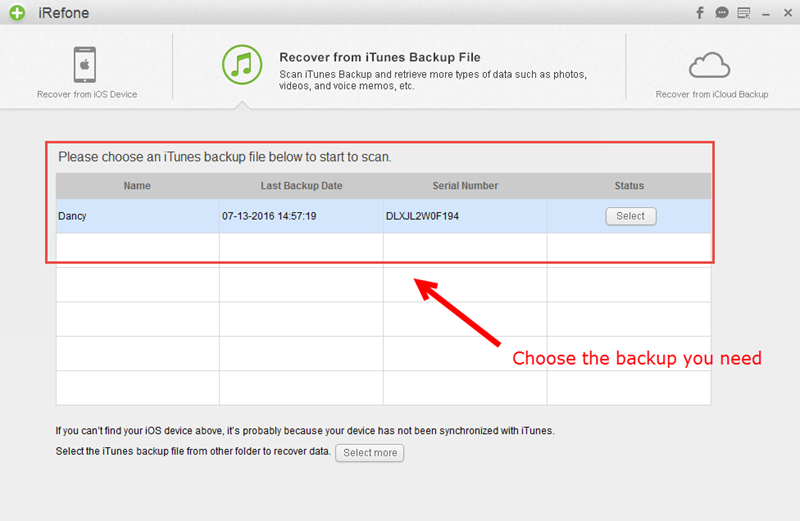 Choose “Messages” icon and it will automatically scan the data in your iTunes backup. Step 3: When the scanning is finished, all of the messages in iTunes backup will be displayed in the scan result. 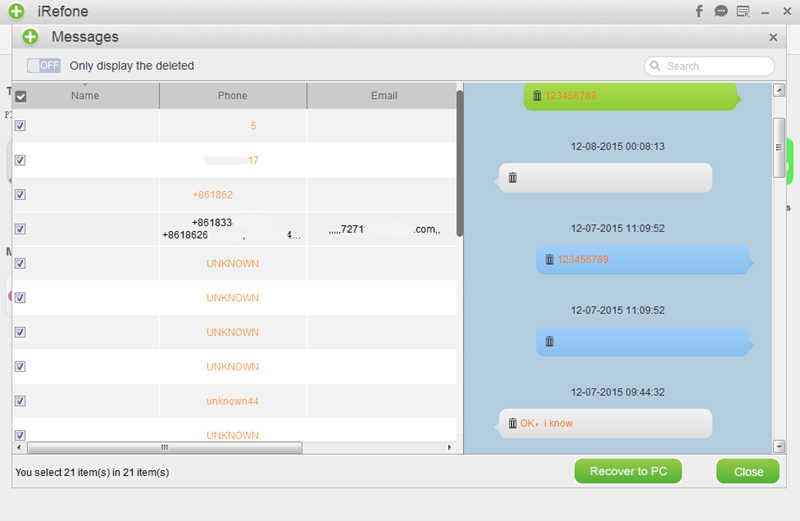 Select the messages you need and click “Recover to Device” to transfer these messages to your iPhone. The transfer process need to restart your iPhone, don’t worry and just wait patiently for the process to be finished. Remember not to disconnect your iPhone during the process.